I was born on New Years Day 35 years ago, which makes me almost 28. So New Year’s resolutions have a little more meaning to me, as does New Year’s Eve and everything else that comes with the turning of a new year. For many years, I took great pride in getting together with Mike, Joe and Kevin every year on New Year’s Eve – whether in Baltimore, Boston or Edinburgh – so I could bring in the New Year with my best friends. Or maybe it was just habit. Or maybe I was just trying to cling onto a part of my life when I was actually happy while turning the page on not just a year, but an age. Or maybe they are my best friends and I try to use my birthday as an excuse to guilt them all into getting together. That sounds more like me. 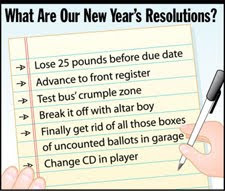 I am one of the saps that makes New Year’s Resolutions though. And I’ve managed to keep a few of them too. My most proud accomplishment was giving up soda for all of 2006. With the exception of whatever they squirted in the top of a Long Island Ice Tea. I noticed I was going through a 30-pack of coke a week, which isn’t healthy or cheap. And guess what happened? Yep. I replaced it with beer and liquor. This was not any cheaper and cannot have possibly been any healthier. But I did it, nonetheless. So now I’m back to about a 30-pack a week. But at least it’s diet coke. So I was going to try to do it again. And then I got the itch on Jan 2nd. And so I chugged a 6-pack of Yuengling. And a fifth of tequila. And did a line of cocaine. This is when I decided to take a different approach. So what I’ve decided to do is make a deal with myself. For every day I write one of these rants/stories/whiny diatribes and upload it to my website so that the five of you can read it, I’m allowed to have soda. Kind of an incentive laden contract, if you will, rather than a denial just for the hell of it. So instead of depriving myself of diet coke and getting drunk every night, I’m using my addiction to caffeine for the forces of good. Or at least for the forces of updating my blog. For the moment, we’ll call it good. Until I start to upload sentence fragments daily just to fuel my addiction. It’s only Jan 18th and I’m already 13 uploads in the hole. Just to clarify, I don’t need any help uploading anything into my hole. Thanks for the offer, Russ.